The Toad Town Dojo is a part of Toad Town featured only in Paper Mario. Here, Mario and the gang can practice their fighting skills against Chan (a Buzzy Beetle), Lee (a Duplighost) and The Master himself, a Toad martial artist. Each battle earns a harder challenge and recognition. In fact, this is the same as battling Jinx (and Jagger) in Super Mario RPG: Legend of the Seven Stars. This is where Mario can earn the First, Second, Third and Fourth-Degree Cards as well as the Diploma. Despite the fact that Mario can face powerful optional bosses here, no reward (or even Star Points) is given other than the aforementioned cards and diploma, as the battles are just a challenge. 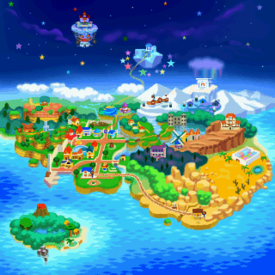 Three people that Mario meets in his adventure in Paper Mario are members of the Dojo: a Toad, in Toad Town, just outside the Dojo with a First-Degree Card, a Dryite in Dry Dry Outpost with a Second-Degree Card, and a Bumpty in Shiver City with a Third-Degree Card. The Japanese characters on the Dojo's billboard read "Way of the old man" in reference to the Master. The names of the two members of the Dojo (Chan and Lee) are references to the famous martial artists/actors Jackie Chan and Bruce Lee. The music that plays here is called "The Dojo", which may also be heard coming through the floor if Mario stands on the far right of the Shroom Grocery's interior. This page was last edited on January 9, 2019, at 08:12.